American painter whose works frequently combined the vigorous, painterly brushstrokes of Abstract Expressionism with the commercial images of the Pop art movement. Born in 1923 in the Bronx, New York, as Larry Grossberg. In 1940 he began a musical career as a jazz saxophonist and changed his name to Larry Rivers. Rivers studied composition at the Juilliard School of Music and was a professional jazz saxophonist.His first encounter with fine art was through a musical motif based on a painting by Georges Braque. He began painting in 1945. From 1947 to 1948 he studied in the New York City and Provincetown, Mass., school of the prominent Abstract Expressionist Hans Hofmann.. In 1948 he studied under William Baziotes at New York University and met Willem de Kooning. In 1949 he had his first one-man exhibition at the Jane Street Gallery, New York.In the 1950s, he became one of the first artists to explore the figurative style which follows abstract expressionism. In 1951 he graduated in art from New York University and met Jackson Pollock. His early paintings were exhibited in New York City in 1949. Rivers' first major work was "The Burial" (1951), a grim depiction of his grandmother's funeral, based on the famous "Burial at Ornans" by Gustave Courbet.In 1952 he designed the stage set for Frank O'Hara's play "Try! Try!". In 1953 he completed Washington Crossing the Delaware. His "Washington Crossing the Delaware" was based on the familiar work by a 19th-century American painter, Emanuel Leutze. Though criticized for its banal subject matter and mixture of styles, the painting nonetheless attracted widespread attention.In 1954 he had his first exhibition of sculptures at the Stable Gallery, New York. In 1956 he began a series of large-format paintings and was included with ten other American artists in the IV. Bienal Do Museu de Arte Moderna de São Paulo, Brazil. From 1951 to 1957 he made a series of portraits of his mother-in-law, of which the harshly realistic "Double Portrait of Berdie" (1955) is perhaps best known. Rivers' works were characterized by competent draftsmanship, a fine sense of color, and the frequent use of complex, fragmentary, and multiple views.. In 1958 he spent a month in Paris and played in various jazz bands. He also collaborated with the poet Kenneth Koch on the collection of picture-poems New York 1959-1960. In 1961 he married Clarice Price, an art and music teacher of Welsh extraction. Beginning in 1961, commercial images, such as cigarette packages, figured prominently in his pictures, which, after 1963, frequently had elements of collage, construction, and sculpture. A particularly elaborate example of such mixed-media works was "The History of the Russian Revolution: From Marx to Mayakovsky" (1965; Joseph H. Hirshhorn Collection, New York City), which had some 30 individual paintings and included, among other objects, a machine gun.In 1965 he had his first comprehensive retrospective in five important American museums.Until 1967 he was in London collaborating with Howard Kanovitz. In 1967 he became separated from his wife Clarice. He travelled in Central Africa and made the TV-documentary Africa and I with Pierre Gaisseau. In 1969 he began to use spray cans, in 1970 the air brush, and later, video tapes. In 1972 he taught at the University of California in Santa Barbara. 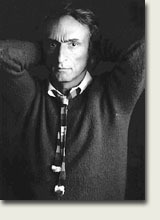 In 1973 he had exhibitions in Brussels and New York. In 1974 he finished his japan series. He was represented at the documenta "6", Kassel, in 1977. In 1978 he began his Golden Oldies Series, revising his own works of the fifties and sixties. In 1980-81 he was given his first European retrospective at Hanover, Munich and Berlin. With the use of illustrative material from advertising and familiar paintings, Rivers produced works that have a broader public appeal than those of pure abstraction. His landscapes, portraits and figure studies of the early 1950s were considered reactionary by contemporary critics because of their realistic drawings and structure. While Rivers' style strikes a balance between abstract expressionism and realistic renderings, his work retains the influence of Hofman in its free, painterly brushwork. Tightly drawn images float ambiguously in space with blurred images and smears. These blurred, smudgy images were not accidental, but part of a deliberate process. About them, Rivers once said, "I have had a bad arm and am not interested in the art of holding up mirrors. "Areas of canvas sometimes remain bare and devoid of color. Rivers' use of these bare areas has been compared with Cézanne's watercolor technique. The intentionally unfinished areas emphasize the process of painting. While Rivers' paintings can be interpreted as a comment on the politics of the current art scene, they also represent personal experimentation with new forms. Washington Crossing the Delaware (1953, Museum of Modern Art) represents an attempt by Rivers to shock artists into reacting in new ways.